You can tell the both of y'all ain't listened to not nann part of that video (if you watched it in the first place) except where he said he didn't agree. He spoke on this exact point and said the exact same thing. I did watch and you can't say you disagree with someone's life but then say you respect them. That's not how respect works. Too often people use that as an excuse to hide their homophobia. 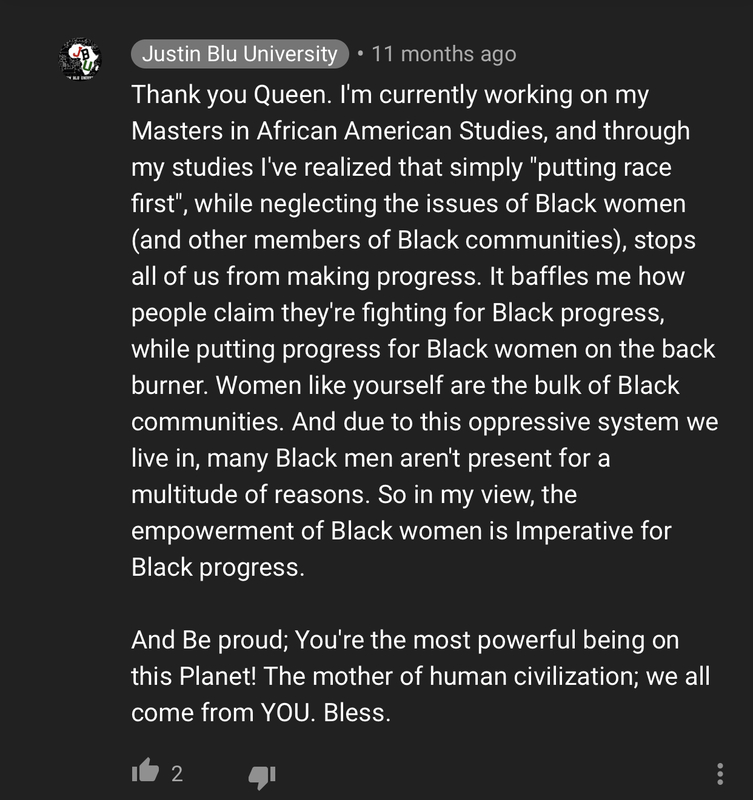 In the vid that was posted he said he doesn't support the lifestyle but believes the contributions that LGBTQ community have made towards black empowerment shouldn't be ignored. And on top of this being gay is NOT a lifestyle. It's a sexuality that's a part of someone's being. That can never be a lifestyle and him and the the other guy in that vid need to chill with that. Matter of fact people IN GENERAL need to chill with that. So I'm still on the fence with him honestly. Excited for him, but how can ya'll claim he's so woke when stuff like that is coming out of his mouth?^ If you don't "agree with the lifestyle", fine, but he's acting like homosexuality is a genetic defect that will just be bred out of us, like it hasn't existed forever. Yikes lolExcited for him, but how can ya'll claim he's so woke when stuff like that is coming out of his mouth?^ If you don't "agree with the lifestyle", fine, but he's acting like homosexuality is a genetic defect that will just be bred out of us, like it hasn't existed forever. "don't agree with the lifestyle" is kinda sus phrasing too. I can definitely see him on those apps for the gays saying he DL & no fats and no fems. Y’all are just looking for reasons to dislike him. It’s embarrassing. No... you seriously need to grow up or go back to Shawho's thread. I think he probably has a lot of great views, but I think his views on homosexuality are a little obtuse. You can like a lot of things about someone and disagree with some of their views. Some people can be very aware on some topics but not so much on others. He doesn't get a free pass even though a lot of things about him seem great. What was the point of even bringing up Shaleen though? Why is it everytime someone has a problem on here they try to bring up something they think is gonna **** someone off? Doing too much. This is about the real world, not the ******* challenge. No... you seriously need to grow up or go back to Shawho's thread. I think he probably has a lot of great views, but I think his views on homosexuality are a little obtuse.You can like a lot of things about someone and disagree with some of their views. Some people can be very aware on some topics but not so much on others. He doesn't get a free pass even though a lot of things about him seem great. Here you go bringing up Shaleen. You honestly- actually nevermind. Imma take this to the discord. sourcup wrote:Y’all are just looking for reasons to dislike him. It’s embarrassing. Here you go bringing up Shaleen. You honestly- actually nevermind. Imma take this to the discord. No. This isn't searching years of tweets for anything incriminating hoping to find something, He said this in February. I found it by accident since I was actually interested in the points he made in his videos. As graphik said, he said he doesn’t agree with the lifestyle.. which a whole bunch of people don’t, however, the contributions that the black LGBT people have made towards the black community should not be ignored. Y’all are going to dislike him anyways because y’all wouldn’t get half of the things he’s talking about really really. But let me not dive too much into that. Why are people calling it a lifestyle? This mentality is so tiring, and sourcup is tiring. I already know what you're trying to do. Yes we aka non-black people are instantly looking for something to hate him for? Wrong. We disagreed with one of his views. I've sung him nothing but praise for everything else, just like everyone else on this thread. I said it's fine if he doesn't agree with the gay lifestyle (still not the best wording but whatever), what I don't agree with is him thinking that homosexuality is something that's *wrong* or will/needs to be *bred out of us*. Just like we supposedly won't get everything he's talking about really really, sounds like this is something that he wouldn't get really really, considering he's not gay. The LGBT community does have its own lifestyle being that there are particular things that the average straight person may not relate to. There was nothing offensive about that comment. "When asked if he supports gays, he said he supports reproduction and the gays will become extinct over time." I think most were referring to that comment^ as something they disagree with/ find to be ignorant and obtuse, myself included. "When asked if he supports gays, he said he supports reproduction and the gays will become extinct over time. "I think most were referring to that comment^ as something they disagree with/ find to be ignorant and obtuse, myself included. But that's not what y'all are ******** about. You've all clearly stated that you didn't like how he said it was a lifestyle and how you think he's a hypocrite for respecting people, but disagreeing with their "lifestyle". You can disagree with the way someone lives & acts, but still respect them. WittyWrath wrote:The LGBT community does have its own lifestyle being that there are particular things that the average straight person may not relate to. There was nothing offensive about that comment. Basically I only have a problem with how he is "for reproduction" and thinks gays will go extinct, like I said over and over. He's basically saying a slightly more articulate version of "it's Adam and Eve, not Adam and Steve", by saying he's "for reproduction", which is ignorant.